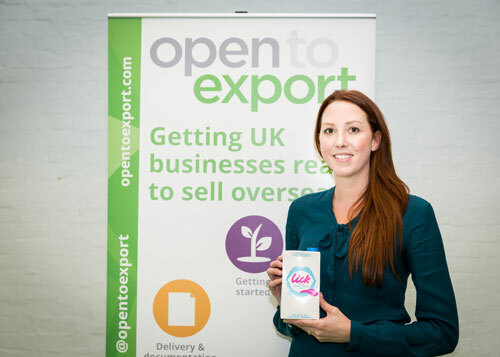 Following another inspiring Export Action Plan final, we’ve asked each of the finalists about their experiences using the tools and for their export tips for future entrants, starting with the winners – Lick Frozen Yogurt. Alexandra Hargreaves presented for Lick Frozen Yogurt. Lick is a UK based frozen yogurt brand, famous in its field for opening the first froyo shop in the UK and then developing the world’s only frozen yogurt which is made entirely from yogurt (other brands can only reach a maximum of around 70% yogurt). Lick brand goes beyond yogurt, we also release music on our record label, and actively support grass roots environmental campaigns (most recently, Lick raised thousands of pounds for bee hives in Brighton). We started to export 13 months ago following our first international trade show, Anuga in Cologne Germany. The desire, or need, to export began early on when we realised that given the nature of the product being frozen yogurt, to achieve consistent sales all year round we needed to find customers in warmer climates or regions in the Southern hemisphere. Our export vision is to become the market leader in premium frozen yogurt in the GCC region and South East Asia within the next 3 years. We’re confident our export sales will surpass our domestic sales during this time. The export action plan was very useful as it forced me to take a step back and consider where we should be focusing and investing our time / money to achieve our export goals. It also prompts you to consider your products, location, pricing and route to market which are all very important aspects of an export strategy. It’ important for businesses to carefully consider their export plans as opposed to getting distracted and letting international inquiries drive their export growth in areas that may not be worthwhile long term or that may affect better opportunities in that region later on. The plan has already helped accelerate our export goals by narrowing down our target regions therefore we’re no longer wasting time pursuing opportunities outside our target regions or with potential partners who don’t fit in our desired route to market strategy.